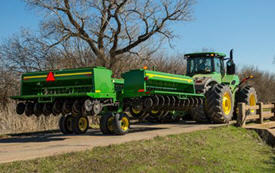 Drawbar support is required for 35-ft drills when using a 7800 Tractor. 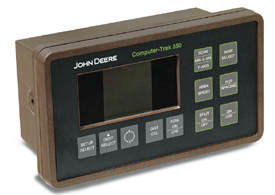 For installing 150, 250, 350, and 450 ComputerTrak monitors and front-fold control console with Deutsch connector or half-width disconnect control console on 1760 and 1770 12N Planters. Includes monitor mounting brackets, cab access, and rear connector mounts. Does not include radar equipment. Radar is required except when using the 150 monitor. The select lift kit allows an operator to selectively disengage a complete box and openers, and is ideal when drilling out point rows and headlands. 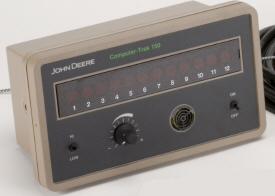 The control switch is located in the tractor cab, and there is a toggle switch for each box. One master switch is used to override or disengage system. Switches activate solenoids, which reverse oil flow, raising openers out of ground and disengaging clutches. 1. 4WD tractors require one R100373 adapter plate to mount the console and one AN280262 wiring harness to extend the console harness (Parts). 2. 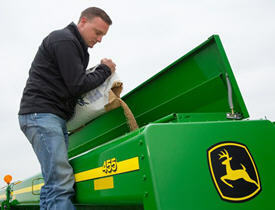 On tractors with a two-pin convenience electrical outlet, order one AA37254 (Parts) two-pin to three-pin adapter. 3. On tractors without a convenience electrical outlet, order one AE50549 and one AA37254 (Parts). 4. Compatible with closed-center or pressure-compensated hydraulics. Not compatible with open-center hydraulics.